You HAVE to love this article and photo from the Los Angeles Times about a guerilla gardener movement taking root in L.A. They make seed bombs and toss them onto neglected lots and such, causing plant life to grow. What a groovy idea! 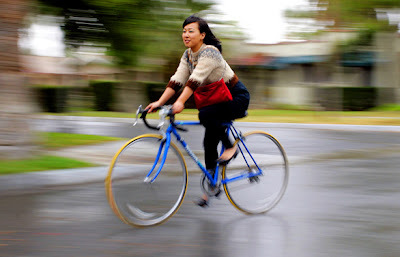 And the photo is brilliant - Copenhagen Cycle Chic goes to Los Angeles. The caption for the photo: "With the seed bombs stowed in her red bag, the stiletto-wearing Caroline takes off on her bike in search of vacant patches of public space. To plant the seed bombs, she digs holes with a trusty tool — the heel of her shoe. “Stilettos work really well,” she says, grinning." There is a cool photo series about how to make seed bombs, from whence the above photo comes. Thanks to David for keeping us in the loop by emailing this story. A propos the comments on the previous post about Choosing a Bicycle, he signed his mail: "David (who only owns one bike with a chainguard AND fenders)". Heyy I'm Los Angeles born and raised! I checked out ur blog earlier or I should say yesterday sometime and thought I'd check it again before I went to sleep.. Your posts are an inspiration to me! Great to hear from you both. Thanks for the link, linda and great to hear you're inspired, soulful jenn! Gardening and bicycles - perfect together! My Parisian friends sent me a guerilla seed packet last year - seems people are going around the French countryside spreading wildflower seeds. Reminds me of Massachusetts-born "Johnny Appleseed", but for beauty, not food. It is true that bikes and gardens go perfectly together. I have a community garden plot I get to on my bike - I'll have to take a photo of the holster I rigged to carry the big shovel on my bike. and charlotte... you had better send a photo! I work in landscaping and bike mechanic, and i never think of seed bombs. Me and my girlfriend project to paint bikes lanes in Montreal. I'm gonna have a lot of seed bombs for that night.